Cristiano Ronaldo has won the Ballon d’Or for 2016, the fourth time he has been named the world’s best player. 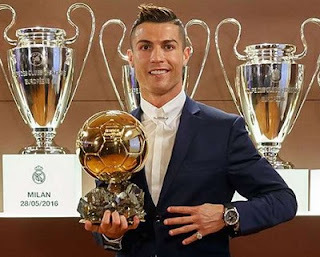 The 31-year-old started the year with critics, claiming he was past his best, but went on to win the Champions League with Real Madrid and Euro 2016 with Portugal. The Club World Cup could still be another feather to his cap before the end of the calendar year. Ronaldo has scored 51 times for club and country in 2016 from a total of 55 appearances. Of those 51 goals, 38 were scored from 42 matches at club level – 31 in LaLiga and seven in the Champions League. He netted 13 times in as many games for Portugal in 2016 – his best goalscoring year at international level. The forward has also produced 16 assists for his team-mates, 14 for Madrid and two for Portugal. This is the sixth consecutive calendar year where Ronaldo has scored 50 goals or more. Ronaldo has spent 4,794 minutes on the pitch in 2016. Ronaldo was involved in five goals in his seven Euro 2016 appearances – scoring three times and producing two assists. The Portugal international has moved on to 376 goals for Madrid in his career with the club – no other player has passed 350. Ronaldo won his third Champions League title this year, his second with Madrid. Ronaldo averaged one goal per 94 minutes for club and country in 2016. In LaLiga, that rate falls to a goal per 84 minutes – he netted 31 from 30 league outings this year. This year Ronaldo became the first player in LaLiga history to score 30 or more league goals for six straight seasons.